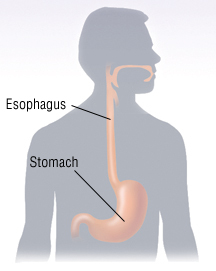 Stomach cancer, also called gastric cancer, is the uncontrolled growth of abnormal cells that form the inner lining of the stomach. The disease often does not cause symptoms until its later stages. Usually, by the time stomach cancer is diagnosed, the prognosis is poor. Most people who are diagnosed with stomach cancer are over age 60. The disease rarely occurs before age 50. This type of cancer is particularly common in Japan. multiple family members that have had stomach cancer. Eating plenty of fruits and vegetables may reduce the risk of stomach cancer.